When you’re in college, sometimes money can feel a little scarce. 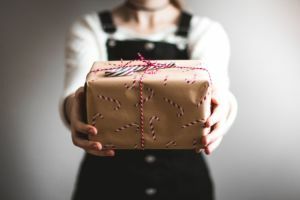 You may or may not be working a job while managing all your homework and classes, but either way, funds can still seem a bit tight when you consider buying gifts for all your family and friends come the holiday season. It’s tough to find someone who isn’t excited about baked goods. Whether you bake a whole batch of your famous Christmas cookies or you assemble a variety of mason jars, including dry ingredients and instructions for baking, there’s no doubt that you’ll delight the receiver. One thing to keep in mind, however, is allergies. If your gift receiver has a special diet she tries to follow, such as avoiding foods with gluten or dairy in them—it’s important to take that into account. Luckily, there are plenty of fabulous recipes out there today that take a whole slew of dietary needs into account. Of course, the important thing to remember here is that you probably want to avoid regifting a gift to the same person who gave it to you. That could be both hurtful and embarrassing. However, if you’ve been given something that you really don’t use or care for, feel free to pass it on! This is an inexpensive way to give friends and family a nice present, but just be sure to use discernment as you pick and choose what to pass on. Now the options for this gift idea are really endless. If you are artistically inclined, consider gifting some of your work to friends and family! Maybe you can write beautiful poetry or you’re skilled in drawing or painting. Wherever your talent lies, consider creating something that either reflects the individual you’re giving it to or your relationship. Even if you aren’t super crafty, there are tons of make-your-own _____ at craft stores! You could knit a scarf or even do a paint-by-number piece. Just as parents love to hang their children’s artwork up on the fridge, a handmade gift can carry with it a whole lot of meaning and love. Sometimes just spending time together is gift enough! Ask a friend if instead of a store-bought gift, you could gift them some sort of experience! Plan an inexpensive evening with a friend that includes coffee, perusing through a bookstore, and some fancy dessert you’ve made back at your place. Or see if a family member would want to eat a picnic-style dinner you’ve prepared on your living-room floor and go to a movie with you afterward. Use your imagination and don’t be afraid to not give a typical, classic gift. You really can’t go wrong with candles. Some candles cost $10-$20, which can feel like a bit of a splurge on a normal day, but when purchased as a gift, the price feels more appropriate. Try to do some sleuthing and figure out which scents your gift receiver tends toward: does he or she like more woodsy, spicy, holiday-like scents, or is he or she more into the beachy, light, airy fragrances? Don’t forget about food scents: creme brulee, freshly baked cookies, and sugary fragrances can be a big hit! Whether it’s babysitting, pet sitting, lawn care, photography, or car maintenance, leverage your gifts and a servant heart and turn it into a gift! For something like this, it’s worth going the extra mile and creating some sort of “coupon” that the receiver can turn into you when they are ready for their service. Add a deadline, and follow up with this individual to make sure they actually use the gift and don’t forget about it!